• Self-adhesive petals, made from the highest quality silicone and approximately 2.5 inches wide. • Adhesive sticks only to your skin. • Covers just what you need, so you don’t need to worry about your outfit. • Adhesive and non-adhesive straps designed to work exclusively with NuBra bras with center clasp for extra support. • Straps clip into each bra cup's center clasp, and stick to your shoulders (Nu Lift) or designed to be worn halter style (Nu Halter). 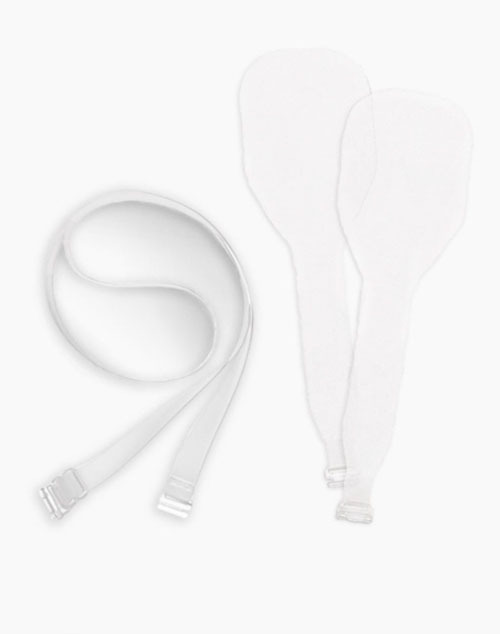 • Contains one pair of clear adhesive Nu Lift straps and one clear non-adhesive Nu Halter strap. • Our most popular style works for all figures. • Get contoured cup edges that provide a totally smooth finish.